Yes, Ghlaghghee is excited to see you again too. Obviously. * I mentioned a few days ago that my primary goal for the year at this point was to focus on novels, because, well. It’s been a bit since a new one’s been out. But a secondary and related goal to this is to do a better job writing on a regular basis. You may recall that last year I took some time to write That Super Secret Project That I Cannot Tell You About, and one of the goals of the TSSPTICTYA was to see if I could get into the groove of writing every day on fiction, rather than my usual practice of unloading several thousand words at a time and then mucking about for a week afterward. Well, the experiment worked fine and so for 2010 my plan is to write pay copy every day. What does this mean for you, the faithful Whatever reader? Probably nothing much, except to say that as in my experience I do my fiction stuff best in the morning before I’m distracted by the real world (and also, the Internet), so my plan is to keep away from everything and everyone, online and offline, until I meet a daily writing quota. From a practical point of view that probably means that AM updates around here will be less frequent, unless they are written the day before and then scheduled for morning publication, or are very short status updates, and I probably won’t do a whole lot of commenting on the site before I meet the daily pay copy quota. As usual, this is the plan, not the reality — we’ll see how the process goes in real life. But it’s good to have a plan, and this is a pretty good plan, which if I execute it correctly means more pay copy done and more time for everything else as well. At this point in my life, I really am seeing the benefits of organization. Pity it took me 40 years, of course. But that’s life for you. * I hear you say, hey, yeah, what about that Super Secret Project That You Can’t Tell Us About? Can you talk to us about it yet? No, because then it would be The Project That Is No Longer Super Secret That I Am Telling You About, now, wouldn’t it? And it’s not that. Clearly. Suffice to say it’s been done for quite a while now, and I will be excited to tell you about it when I can, and indeed I’m mildly aggravated that I can’t share it with you yet, but that’s just the way it is at the moment. If it were up to me, I’d share details. But it’s not, so all I can do is write oblique and annoying paragraphs like this one, letting you know that’s there’s something out there you don’t know anything about. Sorry. * Going back to the first point of being more focused on fiction writing and novels in particular and pay copy in a general sense, and to confirm something I’ve noted before, 2010 is the year I cut back on my public appearances and convention-going. At the moment, I have only one science fiction-related convention at which I’m scheduled to participate: the Phoenix ComicCon over Memorial Day weekend. My only other currently scheduled science fiction-related event for 2010 is a talk at the Merril Collection in late April (I believe April 23rd). And the week after that I pop into the Romantic Times BookLOVERS Convention, because they asked me to and because it’s conveniently located this year in Columbus, which is right down the road from me. And really, that’s all I’ve got. It’s possible I’ll show up at a couple of other conventions this year, but if I do it’ll be just to hang about and see friends and to be a fan rather than be a pro, so I won’t be announcing those if I go. The only event up in the air for me right now is AussieCon4, this year’s WorldCon; we’re still looking at schedules and costs and other factors. I would love to go, so that’s not the issue. It’s everything else involved in the decision-making process. I support having the WorldCon truly being a global event and taking place in cities that are not in North America, but it does mean more planning on this end. Now, I reserve the right to change my mind on any of this, particularly in the second half of the year. If, for example, I get so much work done by July 1st that I feel I can relax a bit, I might slot in a few appearances. And otherwise there may be other extenuating circumstances in which it may make sense for me to pop on my “pro” hat and show up somewhere. But for the moment, 2010 feels like a good year for me to take a break, focus on work, and get stuff into the pipeline. So if you want to see me in an official capacity in 2010, be in Toronto, Columbus or Phoenix. Hey, they’re all nice towns. And in any event, I’ll be here all year long. Tough to be a Movie Star, Ghlaghghee. I hope your super secret project involves either a top hat or a fantastically experimental fiction project in regard to publishing medium. Either way, I’ll be cool with it. Because I know that matters to you. Curious–what is your daily writing quota? It is always good to have a plan. This is what my wife would call, sit down, shut up and work. Writers tend to call it BIC. What, nothing about the spiffy new header? Sooo…when are you coming to Japan? Cause, you know, Japan likes you, too. 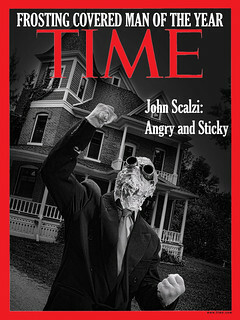 You remembered my birthday John Scalzi! 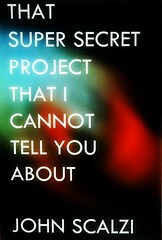 Clearly your That Super Secret Project That I Cannot Tell You About is a secret project to surprise me on my birthday! 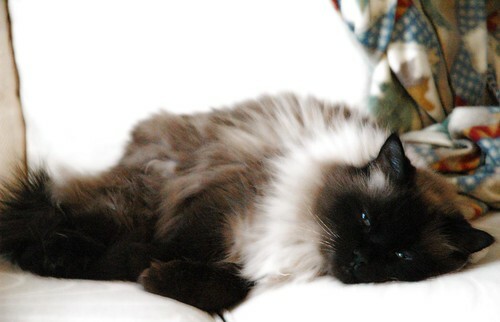 Ghlaghghee is really a beautiful kitteh. Make sure she gets a really nice cheezburger. It’s a coffee table book of cat photos. Right? You spent all last summer trying to get Ghlaghghee, Lopsided, and Zeus in just the right poses, then come up with cute LOLCats captions. Didn’t you? Didn’t you? On pain of the comfy chair, confess! Confess! Well, whatever gets us another book like Android’s Dream has to be good. O Great Scalzi, what a superb picture of Her Most Glorious Shimmering Perfect Radiance in Repose. In 2009 you arrogantly decided that Magnificent She was no longer responsible for your success and that you could go it alone. Well, that didn’t work out so well, did it? So now you’ve come to your senses and made a commitment to regain Her Favor. The spiffy new header has a distinctly Matrix look to me, except for the color scheme. Perhaps TSSPTHCTUA is a screenplay for Matrix: Resurrection. Seriously, I’m hoping for an OMW movie, though I doubt that’s TSSPTHCTUA. Great. We’ll all stop by for coffee. How’s 2:00 on Thursday? Maybe the screenplay for Uwe Boll’s Next Big Film? Chang! Long time no post! When did the doctors let you out? Looking forward to whatever the super secret project is. I’ll just casually mention that World Fantasy is also conveniently located this year in Columbus, which is right down the road from you. Bummer. I was hoping you’d show up at Readercon this year. Oh, well. That super secret project is a movie script for a mash up of the movies Fanboys & Misery isn’t it? 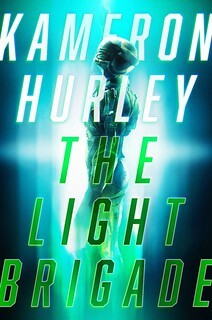 Four twenty something geeks grow up while on a roadtrip to kidnap and torture their favorite science fiction author until he writes a long awaited sequel. Hope you can make it to AussieCon. I’ve only got to cross the bloody Tasman Sea from New Zealand, and it’s looking financially and practically iffy. Still, if you can Melbourne is a really wonderful city. Well, if I go, I’ll definitely sign them. Please please please please please come to AussieCon. Australia needs more visits from cool Americans like you, we’re dreadfully overlooked. Congrats on the goal. Writing everyday for fiction is tough, but it’s a great goal if you have the time and motivation. My goal is to develop at least one page per week for my creative writing website. Once it’s complete than I’d like to work on finishing a novel this year as well. I find that my non-fiction writing has taken all the fun out of writing and I feel less than motivated to write fiction. But I miss it, so I can’t wait to get back to it. I know what the secret project is. John Scalzi was hired by Wizards of the Coast to go through the late Gary Gygax’s papers and produce Wizards’ new flagship RPG system from them. D&D will be sold to Paizo Publishing — since they’re doing a better job of producing a D&D game than Wizards is — while Wizards will be publishing the new second edition of Dangerous Journeys as written by noted author John Scalzi. The first release for the system will be Dangerous Journeys: Mythus; to be followed by Dangerous Journeys: Unhallowed, Dangerous Journeys: Changeling, and Dangerous Journeys: Old Man’s War. DJ: OMW will be bundled with the meta-adventure/setting book Zoe’s Tale, reproducing the milieu of the book for adventures and exploration.